There are many difference purposes for a concrete slab. If you are a do it yourself type of person, then knowing how to pour a concrete slab may come in handy sooner than later. It can save you money in the long run if you know how to pour concrete properly on your own. They are used as foundations for houses, buildings and more. Concrete slabs are also used for walking areas, patios, driveways and much more. Pouring concrete is not the most difficult task to do. It is however, very messy and as with anything, the task is easier if there are more than one pair of hands at work. 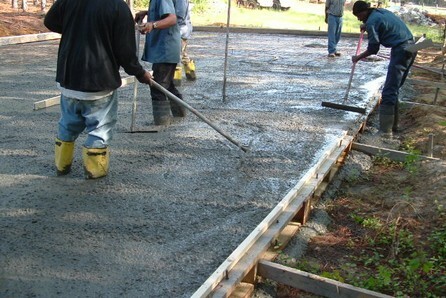 Here is how you can pour a concrete slab. Read on for more information. Start to dig your site according to its planned use. If this will be an area that has lots of traffic, then dig the area up a minimum of eight inches. This makes room for the gravel and how thick the concrete must necessarily be. If this area is not a heavy traffic area then, you can dig the area out at six inches. You should always dig the area four inches wider than the measurement of your slab. This compensates for the wooden barriers that have to be used. Put 2×4 inch boards around the perimeter of your dig site. Hammer the woods stakes into the ground to secure the boards. If your concrete slate is a large one, put some mesh down inside the area. This will give added fortitude and durability. Use the shovel to place a minimum of 2 inches of gravel into the area you plan to pour the concrete. This is your base for your slab. It will make sure that the site also has proper drainage which is imperative. The concrete won’t buckle or heave when the weather changes. Use the wheelbarrow for this next step. Pour the concrete powder inside. Now add the correct amount of water. Follow the manufacturers directions. Mix the two together well. Pour the newly mixed concrete into the framed area. Pour the concrete a minimum of four inches if the area is not heavy traffic. Pour the concrete six inches if the area will be heavy traffic. Smooth the concrete over the top with a trowel. Even all the surface area gently. 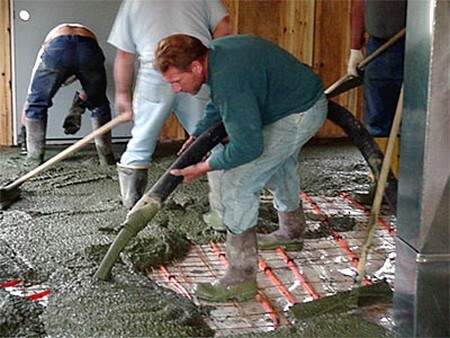 Allow the concrete to dry completely before there is any activity on it. You will need about 102 days for all concrete to set and harden.